A Victorian is one of the most popular conservatory styles and it is not hard to see why. Inspired by an era when Gothic style architecture, complete with ornate crestings and finials, saw a romantic renaissance. These conservatories are as versatile as they are engaging. Not only do they have the ability to complement almost any type of property, they can also be readily adapted to suit whatever space is available – whether that’s a large garden or small patio area. A traditionally classic and elegant design, the Victorian conservatory is a popular choice for homeowners who are looking to add affordable living space and enhance their property. Whether you want more light or more privacy, a Victorian conservatory adds sophistication and charm to your home. Our expert conservatory planners will work and create a design that suits your lifestyle and enhances your property. 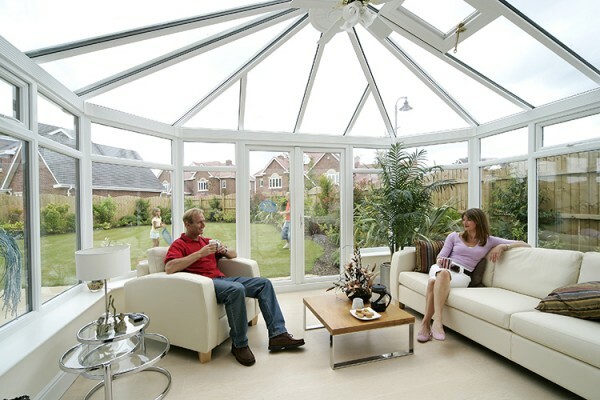 Today’s modern Victorian conservatory can be adapted to suit modern or traditional properties. It is especially suitable for smaller gardens or properties that lack space. When planning your Victorian conservatory, we work with you to design a conservatory that exceeds your needs, explaining the choices and finishes available. Victorian conservatories are characterised by their french doors and framed glass. We can design fully glazed or part glazed conservatories, depending on the location and needs of your property. We offer a range of crestings and finials to create the perfect style and a focal point. UPVC conservatories are available in a large variety of colour options and are popular with homeowners. UPVC requires little maintenance and offers a low-cost design. While many of our customers choose a white finish, there are a range of colours and finishes available, including a realistic wood-grain finish. Depending on your property and design, our Victorian conservatories can be designed with either a pitched roof or a double-hipped roof. A pitched roof slopes upwards from its sides, much like the roof design of a house (where the apex part of the roof forms the ridge). Alternatively, if your property has height restrictions, then we can design a double-hipped roof design. If you have a long and narrow garden, then this design can also project out into larger gardens. Our expert conservatory installers will offer their advice and experience to help you design the Victorian conservatory you have always dreamt of. Why should you choose Countryside Windows for your Victorian Conservatory? • We offer a deposit protection certificate and an insurance backed guarantee to underwrite our own 10-year comprehensive warranty.